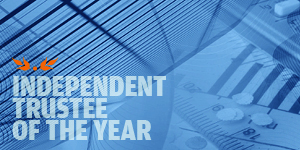 Nominations for this award will be accepted from Independent Professional Trustee Companies, the winner will be a firm will that has contributed significantly to development of Pension & Private/family Trust business. The winning firm will demonstrate their commitment to the Irish Market whilst developing opportunities in other jurisdictions. In addition the winner will be able to demonstrate the desire to promote a better understanding of Pensions & Trust law in the financial services industry.